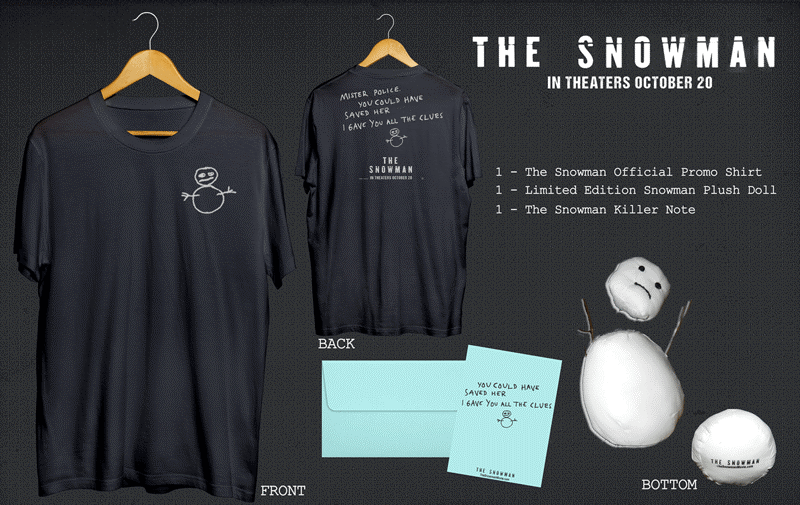 GIVEAWAY: Win This Exclusive Prize Pack From “THE SNOWMAN”!! To celebrate the release of this terrifying thriller starring Michael Fassbender and Rebecca Ferguson we have a Snowman Killer Blog App and a giveaway for the readers of CinemaDeviant.com. 1 – Limited Edition Snowman Plush Doll: This limited edition Snowman plush only has a run of 200 pieces worldwide. It is a replica of the killer’s Snowman and features a detachable head and the Snowman logo on the bottom. 1 – Replica Snowman Killer Letter – A replica of the Snowman killer’s note. All you have to do is enter down below and cross your fingers, toes and eyes! The contest is open to U.S. Residents Only. The winner will be notified by email when it’s over. Winner will be announced by October 30th and has 24 hours to respond before I do another random drawing. Good Luck everyone and look for The Snowman in theaters NOW! This entry was posted	on Tuesday, October 24th, 2017 at 6:06 pm	and is filed under Giveaways. You can follow any responses to this entry through the RSS 2.0 feed. You can leave a response, or trackback from your own site.